Excellent concert! 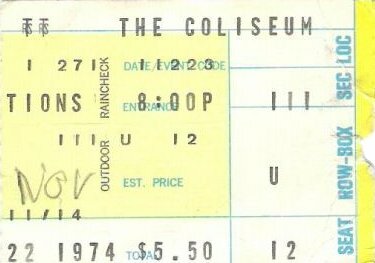 It was my first date with Doug Prikryl and the first of many great concerts we went to. We separated but remained friends till he passed. 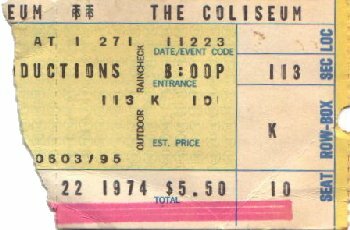 The Show in Cleveland on 11/22/74 was the first time I actually saw Yes in concert, although I'd been a big fan for nearly four years since the release of The YES Album ( I had worn out my first copy within 6 months...). I didn't get tickets to see them for this tour being in one of my jaded periods - convinced Yes, now one of the most popular touring bands in the world, had gone irrevocably "commercial". As fate would have it a good friend of mine at college came by my room and aksed me if I wanted to go to the concert - he had a ticket but something came up and he couldn't go. His friends were leaving at that very moment. Impulsively, I said what the hell and gave him 15 bucks and took off with two guys I barely knew for Richfield Colesium. Well, it was a concert beyond all expectation - like being lashed to a pier and having the surf wash over you for almost three hours - simulataneously exhilerating and exhausting. Gryphon was a great warm up - I still listen to the four albums by them I subsequently bought. "Gates" was incredible and I immediately fell in love with "To Be Over." The whole show left me literally speechless.